The new Efore OPUS HE family of 19” rack-mount DC power systems are high efficiency power solutions powered by the new MHE 2kW high efficiency rectifiers. The 7U rack configuration delivers up to 6 kW of power, while the 12U configuration delivers up to 10 kW. 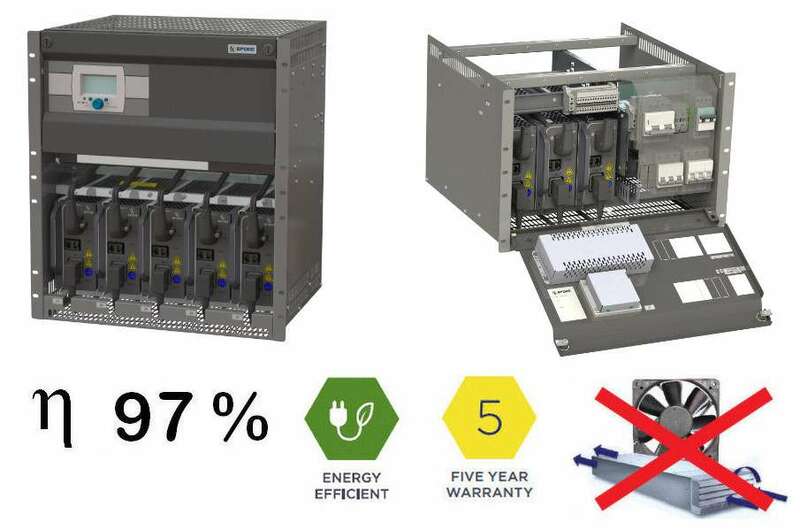 Their robust and reliable fan-free design, modular architecture and use of established components – including the VIDI+ controller and flexible distribution options – ensures the lowest total cost of ownership (TCO) across the 15-20 year expected life span for industrial backup power systems. The OPUS HE series products offer unrivaled efficiency of 97% for minimal environmental impact. They have been designed and optimized for critical infrastructure, distribution and transmission substations, process industries, and railway substations where reliability is always the top priority. OPUS HE Racks are complete power solutions which can be installed inside a system cabinet or mounted to the wall. OPUS HE 12U 10kW rack systems have built-in load distribution up to 10 x MCB + aux contact. The 7U 6kW racks have bulk output for loads. These rack systems support all typical Lead Acid and Ni-Cad battery systems in nominal 24, 48, 60, 110, 125 and 220 voltages.